What's that? 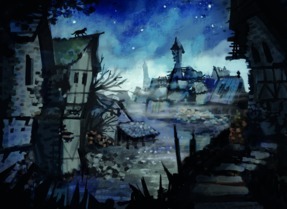 Some kind of fan card version of Ruined Village? Pooka + Donate: Buy a $5 card with Cursed Gold and then Donate before you see the Curse. I guess the practical application of this is to play CG to buy Donate on turn 1 and then get rid of everything except 5-6 Coppers, and potentially buy a $3 on turn 2. I like lyles way better because you can just get a gold with cg and 3 coppers then donate trash everything except gold then use gold to get silver and then just go from there. That's really slow. You want to keep at least 5 Coppers around on your first Donate, and you generally want that Donate to happen on turn 1. I like to do donate at about turn 5 and trash every copper and every estate. My dad did the strategy that you said and I won badly because he had coppers cluttering up his deck. It's good to get rid of your Estates as soon as possible because getting rid of an Estate is ridiculously good for your economy. It's not good to get rid of your Coppers as soon as possible because Coppers are also good for your economy, combined with draw. That's why it's better to Donate t1 to trash the Estates, and get rid of the Coppers little by little throughout the game using a different trasher, or buy another Donate later on in the game, or just build enough draw to draw all the Coppers in some rare cases. Cursed Gold might change the intuition here, but yeah you can Donate Turn 1 and keep 5 Coppers, then buy something costing $5 on turn 3. You should look for a trasher or a second Donate soon after as Awaclus said. The Cursed Gold + Donate opening I envision would be spending Cursed Gold to Donate Turn 1, but keep the Cursed Gold and some Coppers to buy a remodeler like Upgrade or Remake Turn 2. This lets you turn the Cursed Gold into a $5 cost card, except now you have a Remodeler to go along with it that will let you trash the remaining cards Donate didn't trash. And then once the Temples run out ..
Also 4VP per turn, until Silvers run out -- play 2 Temples every turn, replenishing them with a Conquest buy (assuming you have $6). Gain lots of Den of Sins through Horns of Plenty, then have your megaturn and gain all the Provinces. Probably one of the strongest HoP enablers out there. Put Plan on a + card you can buy on turn 2 that you want at least one copy of. Then, later in the game, you can buy that card to get the trash - but exchange it for a Changeling. Hmm. That one feels like a workaround for an unnecessary restriction. I wonder if, with Nocturne hindsight, it might have made more sense for Plan to say "non-Victory" rather than "Action"? you wouldn't be able to plan on mill then. and sometimes you want a 3$ card more than you want a slow changeling. changelings are weak early, when you have low density of good cards in your deck. For this to work, Dens would have to be ignored for much of the game, no? If Horn is the only gainer, then you can use this interaction to punish a player that ignores Horn. Trash your Estates for 3 Gold and 3 Coppers and 15 VP. Will-o-wisp and Bandit Camp. Spoils cost 0, so will-o-wisp picks them up! Plus I got the WOW from pixie, which means goat ate everything else, so WOW was pretty consistently a lab. This is one to look out for when Druid has Swamp's Gift. Wisps and mid-turn-gained Spoils (+more Wisps) is really nice. On top of that, Druid gives you +Buy! Not useful, but certainly neat. When you play an Enchantress, it covers the first Action card played during a turn... Which includes a Werewolf in the Night Phase. Struggling to get the full +$3 from your Horse Traders because it keeps forcing you to discard treasures? End actions without playing the Horse Traders, buy a Villa, play the Villa, then play the Horse Traders for the full amount. Unsurprisingly, Castles/Shepherd is a pretty good combo. Rebuild + Shepherd also works well.